The Free Evangelical Brethren Church, known simply in the Volga German community as the "Brethren Church," dates its beginning to December 3, 1900. The church was formally incorporated on May 13, 1904. Elder Brother Peter Yost led the Free Evangelical Brethren Church from its beginning until his death in June 1927. According to the church records, Brother Yost, along with members of the congregation, became dissatisfied and resigned from the Ebenezer Church in 1900. Following the departure of Reverend Johannes Koch in 1899, some of the brethren felt that they should conduct the church services without the assistance of a pastor. These members broke away from the Ebenezer Church and Elder Yost was chosen to lead the new congregation by casting lots to make the selection. After his selection there was a laying on of hands, a symbolic and formal method of invoking the Holy Spirit during an ordination of church leaders. The former Free Evangelical Brethren Church in 2012. The church building is located at 3605 NE Mallory and remains standing today. Photograph courtesy of Marla Keevy Sanders. The majority of the people that formed this congregation, including Peter Yost, emigrated from Norka, Russia according to the church register. There were also several families from the Volga German colonies of Huck and Kutter. All three of these colonies practiced the Reformed faith and all of founders were adherents of the Brethren movement in Russia. For 22 years, the congregation remained a free church, meaning that it did not belong to any conference. During those years elders and brethren led all of the worship services. ​For the first three months after the congregation was formed, the prayer meetings were held in private homes. The members then built a church 20 feet wide and 30 feet long on a lot owned by Peter Bauer with an agreement that after five years the building ownership would revert to Bauer. A new church was built in 1907 at 3605 NE Mallory to accommodate the growth in membership from 26 original members in 1900 to 96. The new church measured 34 feet wide and 52 feet long and cost about $3,000. The builder was Henry Plicker. Three services were held on July 28, 1907, to dedicate the new church. The first service was held at 10:00 a.m. and Brother Peter Yost read Psalm 84 and then Brother Heinrich Hagelganz gave a sermon from Revelations - Chapter 2, Verse 3. The second service was held at 3:00 p.m. and Brother Masa provided a sermon based upon Psalm 84. After a prayer by Peter Yost, the house of worship was dedicated. The third service was held at 7:00 p.m. and Brother Hiebert preached on Second Corinthians, Chapter 4, Verse 5. It is reported in the church records that Brother Heinrich Hagelganz and Miss Catharina Yost, both talented musicians, provided excellent songs to hear at the evening service. Brother Heinrich Hagelganz felt a strong desire to serve the Christian community in the Portland area as an ordained minister. After his ordination in July 1911, his first charge was the little Bethany Church at Cedar Mills, Oregon. Later, Rev. Hagelganz left the Free Evangelical Brethren Church, with 29 of its members, and organized the Second German Congregational Church at NE 8th and Skidmore on June 22, 1913. On December 3, 1916, the Free Evangelical Brethren Church celebrated its 15th anniversary. By 1917, there were 122 members of the congregation. Reverend Conrad J. Wagner, who was ministering in Endicott, Washington, became the first ordained minister of the congregation in the fall of 1922 and the church was reorganized and incorporated as the German Congregational Evangelical Brethren Church on September 13, 1922. In 1927, the congregation relocated to a newly built structure at NE Mason and Garfield. The structure on NE Mallory was sold to St. Nicholas Orthodox Church who remained in this building until 1980 when they moved to a new location at 2210 SW Dolph Court. Today (2015), the church continues as the Greater St. Stephen Missionary Baptist Church. 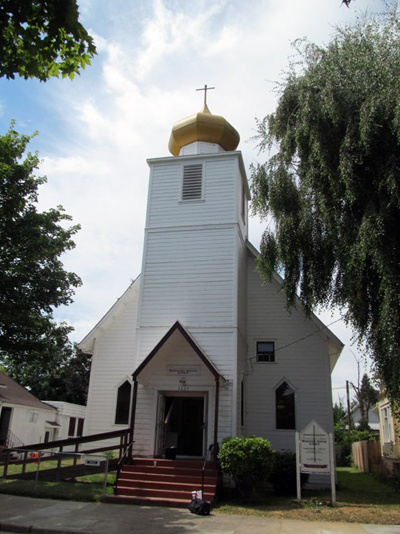 The onion dome which currently crowns the steeple was added by the St. Nicholas Orthodox Church, but it was built by a Volga German. The Oregonian, December 3, 1987, p. unknown.